Loft beds are a great addition to many different small spaces. Lofts can be small areas just large enough for a bed, or they may have enough room for a few choice pieces of furniture. Choosing the right bed can make the difference between a space that is enjoyed and one that is largely ignored because it is unwelcoming. Children tend to love lofts. A loft bed can create a nice secret hideaway that is just the right size for a child. When selecting a child's loft, consider the youngster's preferences, such as color or hobby, but remember that children grow, and you may want to take that into consideration when you look into buying a loft. Study Area: Including a built-in desk or study area beneath the bed is a great choice for older kids and teens who might not have enough room for a desk elsewhere in the room. Play Areas: Many children's lofts come with built-in tents, slides, "tree houses" and even castle towers. If your child is heavily into make-believe and needs a place to play as well as sleep, a play loft may be a great choice. Stairs, Ladders and Slides: Consider how your child will be getting into and out of the loft. Some use stairs for safety, while others use combinations of ladders and slides for added fun. Storage: Maximize the space in your child's room with a loft that has built-in storage. Some lofts include drawers in each riser of the stairs leading up to the bed, others have built-in shelves or even chests of drawers. Lofts with Bunks: If you have two or more children sharing a room, or your child entertains frequently, consider a loft/bunk combination. Oftentimes this includes either a smaller, lofted bed set back from the main bed, or a trundle tucked beneath the loft itself. A Baby offers multiple themed loft beds, including knight, princess and a captain's sleep-and-study lofts. They also offer lofts that have play spaces on top, complete with slides to get back down. 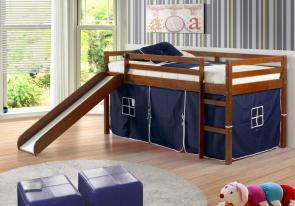 Kids N Cribs makes several styles of loft beds, including beadboard, shaker and Mission styles. Many of their beds come with built-in storage either under the bed or within a chest of drawers. Pottery Barn Kids makes a plethora of bunk beds and loft beds that are truly stunning, plus they work well with traditional or modern decors. Some of their designs include tree house-style lofts, castles and twin-over-full lofts. 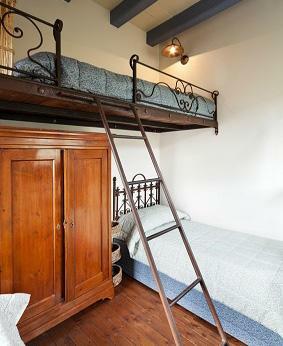 PBTeen carries several loft beds perfect for growing teenagers. Many of their lofts include desk areas built in beneath them, and several also include shelving for storage. Loft beds take up less space in an apartment or home and they can serve multiple purposes, making them ideal for adults as well as for children. The area under a loft bed can be used as a small home office or simply as a place to put a couch and bookcase. The only drawback to using the area under a loft bed is the clearance; most people cannot comfortably stand under a loft without ducking or hitting their head. Adult loft beds are made larger than a child's bed to accommodate their size and weight. A typical loft bed is made to give an adult at least 33 inches of clearance from a ceiling (to avoid head injuries when you sit up in bed) and is built to hold someone weighing 200 pounds. Loft beds are convenient for use in dorm rooms, efficiency apartments, teens' rooms or in guest rooms. Due to their versatility, manufacturers have designed a wide array of adult loft beds for their customers. Work Stations: An updated version of the study area in kid's beds includes things like filing cabinets and computer workstations perfect for adults living in small studio spaces. Shelving and Storage: Several adult loft beds include storage like shelves or built in chest of drawers beneath the bed to help make the most of the space. LoftBed.net sells loft and storage beds from simple, modern designs to heavy, furniture-inspired pieces. Their beds come in both metal and wood. Many come with either built-in storage or desks for added functionality. Riddle Furniture manufactures solid hardwood loft beds in three styles; shaker, classic and panel. All of their beds can come in custom, extra-long lengths to accommodate taller adults, and their lofts can convert to standard beds if needed. Loft beds are convenient and space saving, as well as versatile and available in a wide range of styles. They work well in numerous areas, but not in all, so before you purchase be sure to use these questions as a guideline to help you find the right model for your home. Who will be using the bed - a child or an adult? What mattress size will fit in the area you need it for - twin, queen or king? How much does the person weigh that will be using the loft? How tall is the person who will be using the loft? Would you save money by building your own or using a kit? Do you need additional storage with the loft, such as built in bookcases or cabinets? Is a readymade work station below the bed something you need? What material do you want the loft to be made of - wood or metal? Do want extra features, such as a full staircase instead of a ladder, or a slide added? Does the bed have a theme that will fit in with the overall design of the room? If you are thinking of buying your loft bed online, check out similar models in local furniture stores first. This will give you an idea of how much room you will have under the bed, and help you decide if it is comfortable enough for you or your children to sleep on. Before you commit to the loft, be sure to weigh the pros and cons of the purchase. Loft beds offer extra space; a second bed, a workstation or storage can all be added to the plan. Many loft beds are customizable, which means that no matter how much space or how many features you desire, it is usually possible to find a way to add them. While loft beds offer a great deal, these features come at a price; many of the better built loft beds can be expensive with prices starting at $1,000 for a furniture-style model. Some of the more simple units may be less expensive, but they may hold less weight and may require you to purchase additional storage, desks or features elsewhere, which adds up to hidden costs. Just as there is a wide range of quality in any furniture piece, so is there a range in loft beds. Comparison shop carefully for your loft bed to ensure that you get a sturdy frame with the features that you want for a price that is comparable with the competition. Don't necessarily go with the cheapest option you come across, as quality is an important factor. It's also important to make sure the bed is assembled and installed correctly. After all, a loft bed can pose a safety hazard if not made from top notch materials and put together the right way.